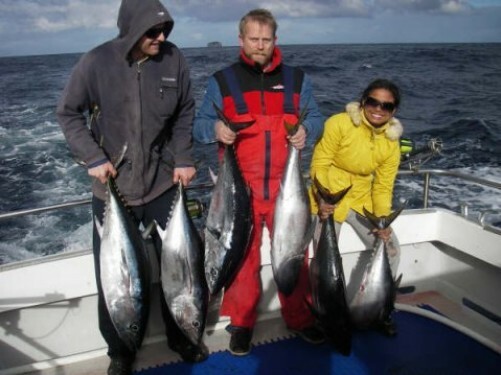 Gamefishing off Eaglehawk Neck in Tasmania is famous for its prized large Southern Bluefin Tuna, as well as Yellowfin, Mako Sharks, Albacore and the occasional Striped Marlin. The big Tuna, Sharks and Marlin are worthy opponents for any angler, and provide lots of exciting fishing. The action is world class and the fishing grounds are close, ranging from inshore out to the Continental shelf, only 8nm East of the Hippolite Rocks. This gives you plenty of fishing time to experience the action. For these big fish, we use heavier line class tackle in the 24 and 37kg categories, using top quality lever drag game reels and pretested line. We have a huge range of rigged lures and provide all the necessary fighting equipment and gear. Eaglehawk Neck is Tasmania’s premier hotspot for gamefishing and Doongara Fishing Charters will put you amongst the action. Deep Sea Fishing off Tasman Island or on the Continental shelf for high quality table fish including Tasmanian Striped Trumpeter, Morwong, Blue Eye Trevalla, and the occasional Hapuku and Rays Bream. Inshore coastal reef fishing is a relaxing and fun experience fishing in clear blue waters with scenic surrounds. Fishing for prolific species such as Morwong, Ocean Perch and Flathead, these scalefish are all excellent eating fish and are available all year round. There is a vast number of reefs and formations along the coastline which are productive for these species, as well as large Tiger Flathead available over the sandy bottom during Spring-Summer months. Light Tackle Sport Fishing for smaller gamefish species such as Albacore and Striped Tuna provides plenty of constant action. Small school sized Bluefin and Yellowfin are excellent sportfish on light gear, with their tough fighting qualities, they test the skill of the angler. Other less prolific species include Yellowtail kingfish, Butterly Mackeral and Slender tuna which are also captured in these waters on occasions. To customize your sportfishing experience, we can offer light tackle in any line class categories, from 3kg – 15kg breaking strains. All tackle is top quality, and we use only pretested line spooled on lever drag reels. We provide all the necessary gear, using the highest quality deck winches available. All terminal tackle and rigs are supplied, along with bait. The catch can be kept live in our wet well, keeping the catch fresh. Fish which are retained are cleaned and bagged for your convenience. Deep Sea Fishing is available all year round, with the best eating fish on offer. Price: $95.00 per Adult (1/2 day), $140.00 per Adult (Full Day). Inclusions: Bait, equipment, fishing cleaning or kept alive in the wet well,tea, coffee and fresh water on tap. Doongara Fishing and Charters is based at Eaglehawk Neck, located on the beautiful Tasman Peninsula in South East Tasmania, Australia. 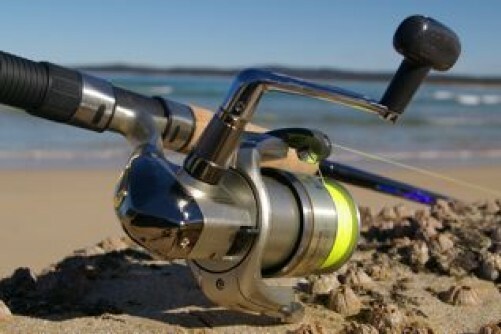 The area is renowned as one of Tasmania’s premier game and sport fishing locations. We offer a wide variety of charter fishing options to suit all types of saltwater angling, or you can sit back and enjoy the amazing coastal scenery and marine life the area has to offer. Large Bluefin, Yellowfin, Albacore, Mako sharks and the occasional Striped Marlin are available in these productive waters, which are a rich feeding ground for big predators. “The fishing is world class, the action is exciting, and the coastline is breathtaking.” This region has produced many record gamefish, and currently holds over a dozen Australian records in different categories for Southern Bluefin Tuna alone, including the all tackle record. The crew is highly experienced, with a 35 year background in game and sportfishing, including 9 years professionally, and has won tournaments, Club events, and held many Club, State and Australian Records. The crew are members of the “Tuna Club of Tasmania”, and fish under “Game Fishing Association of Australia” rules and regulations. All Crew members hold the required qualifications, licenses, and certificates, and we operate under a “Safety Management Plan”. We can accomodate from 1 to 10 passengers on our vessel which is a 36′ Steber “Doongara”. The vessel is in full survey and carries a safety management certificate of compliance issued by “Marine and Safety Tasmania”. 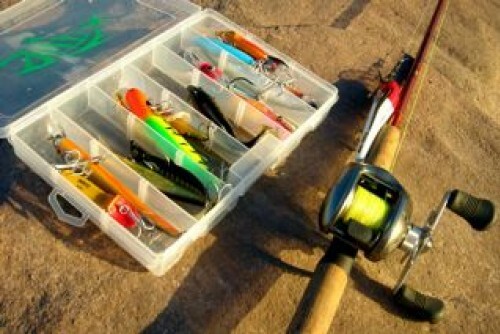 Other Information on Charters:- * All Fishing Equipment, tackle and bait etc.is supplied. All tackle is top quality gear with both heavy and light outfits available. * Carry up to 10 passengers * Experienced crew * Anglers have the choice of retaining their catch, otherwise we promote Tag and Release * Fish retained for eating are cleaned and conveniently bagged. * Hot Coffee and tea is available. Group bookings are available, or for individuals and couples, we operate on a share basis to make up a group. * Bring Lunch and cold drink. (We do have hot tea and coffee available, and have cold freshwater on tap). Lunch and/or cold drinks can be provided if requested at additional cost. Also we suggest you bring a hat, sunglasses, sunscreen and camera. 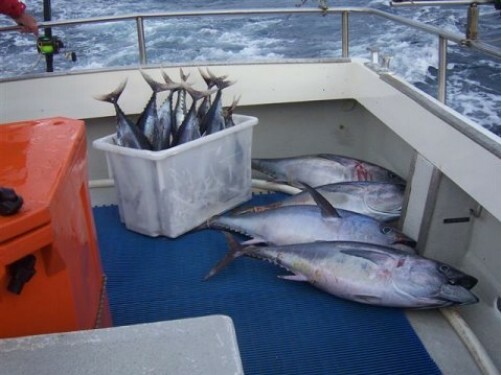 So why not come and spend a day charter fishing in Tasmania with experienced Skipper Scott Johnston on “Doongara”.